Are you exploring the fun birthday ideas for girls Katy TX has to offer? There are certainly some good options out there. You may find a few which seem enjoyable, perhaps even cost-effective. Yet, your child deserves to have more than one of the regular low budget parties that you might want to throw together last minute. If you’ve got a daughter, it might be even more difficult to make it worthwhile. They can be picky or popular and you may feel overwhelmed with organizing the whole party with so many variables to account for. However, we want you to relish in the fact that you won’t have to do this alone. Rockstar SpaBus is happy to help you make an incredible party for your little girl. We know that she is worth the world and we want to help create a scene that will fit her glowing personality just right. This option will be the base offering that we provide. There is a sweet selection of the manicures and pedicures that your daughter and her friends will be able to enjoy. She will marvel at the cleansing mani/pedis complete with floating rose petals, a mint sea salt soak, and a mango quava polishing scrub. All of this is then followed up with a yummy mango Massage, and the nail polish color of choice. Headbands and makeup options are available. Not to mention, all of her karaoke and vevo/youtube desires will be met with our surround sound TV systems. We’ll make sure she loves the setup; her friends will all be so happy for her! There are levels to this! When you select this option, we not only provide all of the options and amenities of the package in the first tier but also a new addition. For her special day, we will add an energizing iced cucumber facial for her and all the friends who were lucky enough to take part. It will be perfect for her skin when we add the blush, eyes shadows and glitter tattoos. Together will the manicure and pedicures she will be in such a pampered state of bliss. This will be one of our most exciting packages. It’s all about glow in the dark, and for the first time in our packages, we are welcoming boys, too! With an allowance of 14 total partiers, you can really make a great party come to life. Her friends both boys and girls will be able to party with her. We’ve added options for the boys that will make sure they’re not left out. We have glow in the dark accessories, nail polish, party props for the boys and mini manis for the girls. It’ll be the perfect way to find the best of both worlds if your daughter doesn’t want her boy classmates to feel left out of her festivities. Dress-Up like a Rock Star! This option will be best for your daughter who is age 4-8. We offer a full selection of spa treatments that are solely for the birthday girl. This means mini facials, mini manicures, mini pedicures, nail design, and even foot and face massages. She will be put in our signature spa robe and given all the props and accessories to make her relive the princess experience. She’ll even have a royal glamour make up to try on that will give her a fancy new look. Her beauty will be overwhelming and it’s certain to make her day! Finally, we have the last and most precious package. Its a party experience all for the mother and your daughter. We will dress them both in the spa robes to give them matching looks. Each of them will get our special manicures and pedicures, but the mother will get her own versions which consist of french manicures and a deluxe spa pedicure to go along with it. The birthday girl will get to do all of her favorite things, sing along with her mom to all the hit songs and look beautiful together. She will share a special moment with her mother that can leave a memory which could last a lifetime. All of our packages are slated to last 1 hour and 45 minutes. If you schedule your party with us we will happily drive to you. When it comes to Katy, TX our limit is within a 30 miles radius from La Centerra Cinco Ranch 77494 and you must be within our radius unless you’re willing to pay a little extra for the drive! Kids love the fact that you can party at home and still make it a spa party. Also, please have your daughter and her friends clean their hands and feet and totally wipe off any makeup or nail polish. Remember, any additional partiers will cost extra once you have filled the quota we allow. 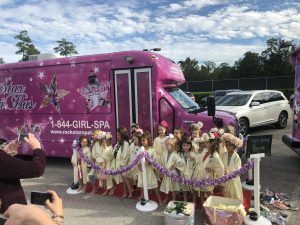 Rockstar Spa Bus is so excited to create the next party experience for your daughter and we want to spare none of the details. Let us come and make her new year start off with a bang. We provide Katy TX Fun Birthday Ideas For Girls that are unique and unlike the normal party, you’re used to. Rockstar is always ready to accept new clients so if you’re interested in working with us, visit our website or simply give us a call at 1-844-GIRL-SPA (4475-772). The city was incorporated in 1945.